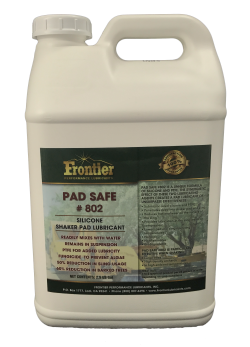 Frontier’s Performance Line of Shaker Pad Lubes. Pad Safe is a unique blend of water emulsible silicone, synthetic lubricants and corrosion inhibitors designed to readily mix in the water storage tank and remain in suspension. Pad Safe was designed, developed and tested in conjunction with three of the top manufactures of tree shakers for use in commercial tree shakers equipped with water injection lubricators. 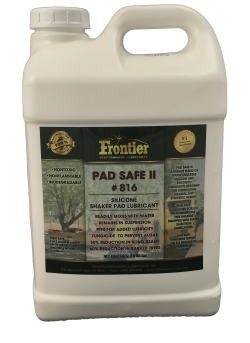 Pad Safe II is a unique blend of water emulsible silicone and synthetic lubricants designed for lubricating natural and synthetic rubber. 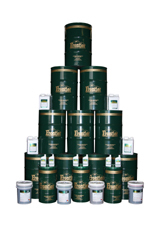 Pad Safe II is designed for use in commercial tree shakers equipped with water injection lubricators. Pad Safe will readily mix in the water storage tank and will remain in suspension. Pad Safe II has been tested by both Custom Harvesters and private operators with a 50% reduction in sling usage and 60% to 80% reduction in barked trees. Pad Slick is a heavy duty Silicone lubricant specifically designed for lubricating the shaker head pads and slings on commercial nut harvesting machines equipped with conventional manually lubricated heads. This product is not affected by heat, and will maintain elasticity and pliability in rubber components. 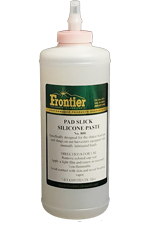 Pad Slick Solid Silicone Lubricate is a heavy duty silicone lubricant specifically designed for lubricating the shaker head pads and slings on commercial nut harvesting machines equipped with conventional manually lubricated heads.